Twitter are notoriously guarded about user information and Twitter usage statistics. 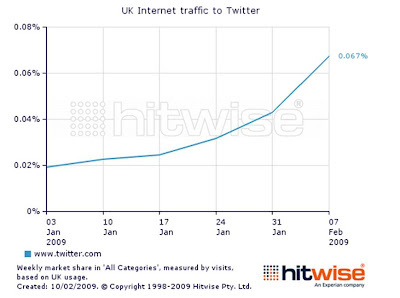 In August 2008 I wrote about the Twitter usage figures and Twitter demographics that were available - data from Hitwise and Compete. As Twitter has grown there is more information available - yet still nothing from Twitter officially and statistics generally do not take account of usage of Twitter tools like Tweetdeck and Twhirl. 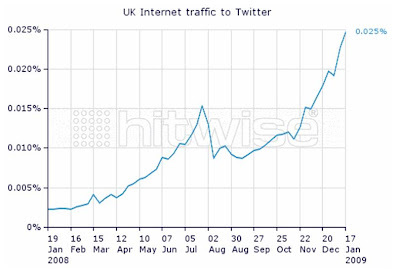 So all the surveys show Twitter traffic increasing substantially. The interesting piece is how the different data sources disagree around demographics. In Aug 08 Hitwise claimed the Twitter audience was mainly middle aged men, whereas Compete data showed it was predominantly a young audience. 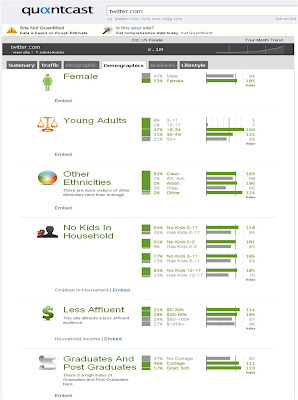 The same disparity can be seen above with Nielsen showing that middle aged (unique) users 35+ are the dominant user segment, whereas Quantcast are indicating that younger users are dominant. People access Twitter in different ways (mobile, web, apps) and until Twitter publish official data then the above is the main information we have to work with. The other thing with twitter is that anyone can view a user's posts (generally speaking), so people reading about Stephen Fry and twitter, for example, can see his tweets without signing in. This means that in many respects the number of visitors to twitter is not that useful, especially as there is no advertising. I use these figures for the number of active accounts - http://twittercounter.com/ counts 1,806,552 accounts (figures at the bottom of the page). it would be great to get details by country too! So, do these stats not include tweets that came from those using Tweetdeck, Twhirl? That is how almost all of those I follow use Twitter. I appreciate the research you've done thus far regarding Twitter's usage stats. 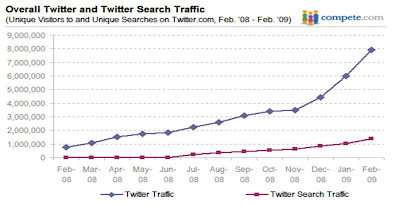 Is there a good website that you can recommend with the latest Twitter global usage stats (web and API)? Just can't find reliable sources with up to date info :-( Thanks. Hi! 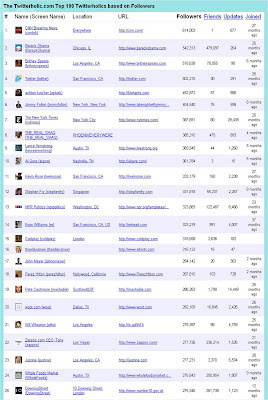 I’ve found another site valuation tool and it seems to provide competitive analysis for free. 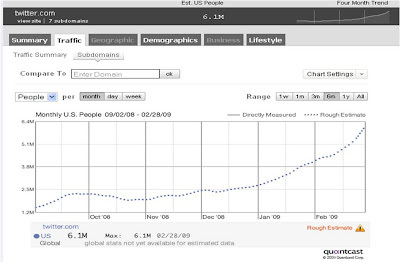 I'm talking about www.estimix.com .The estimation provided by estimix is the result of a complex analysis based on factors like: the age of the website, the demographic structure of the traffic, the countries where the website is popular and sources of the traffic.